Posted on Wed, Feb 29, 2012 : 12:55 p.m.
Ann Arbor Police Chief Jones Barnett Jones announced Wednesday that he plans to retire. 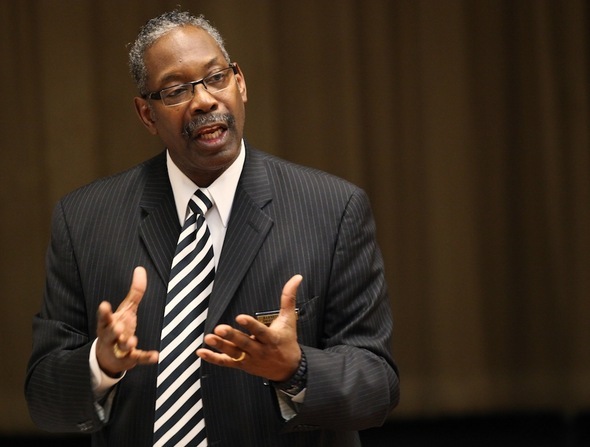 Ann Arbor Police Chief Barnett Jones Wednesday announced he is retiring. Jones announced his plan to retire after nearly 40 years in law enforcement through an email sent to employees, sources said. "I’m happy for his ability to retire," City Administrator Steve Powers said. "I’m sad that he’s leaving the City of Ann Arbor." Powers said Jones informed him of his plan to retire Tuesday. Powers sent the following e-mail Wednesday afternoon to City Council members and service area administrators: "Barnett Jones has informed me and the department’s command staff that he is retiring April 1, 2012. Barnett has served the public in law enforcement for 38 years. He will be a loss to Ann Arbor." Ann Arbor Fire Chief Chuck Hubbard said he talked to Jones two days ago about routine business and Jones gave him no indication he was planning to retire. Hubbard learned about the retirement over a brief email that he received Wednesday. "I'm shocked," he said. "He'll be sorely missed." Hubbard said Jones has been his immediate supervisor since June 2011, when Hubbard was promoted to his current position. "His work ethic speaks for itself," Hubbard said. "He's a professional. He's a fair person. He's been great to me. He's been very helpful in my career." Jones was pressured in recent city budget cycles to make deep cuts to the police department, cuts he didn't want to have to make. He expressed frustrations about that and repeatedly told council members he couldn't afford to lose any more police officers. "We can't afford to lose a police officer," he told council members in February 2010. "Since 2000, we've gone from 216-plus police officers down to 124. Our reality is we have been doing the best we can ... but we're at a point where there are some quality of life issues. As a police chief, I cannot stand here and say I can afford to lose any more police officers." Both the police department and the fire department, which Jones oversees as public safety administrator, have gone through two rounds of cuts since he made that comment, and the city recently outsourced police dispatch services to the county, eliminating even more jobs. More staffing reductions are being considered in the fire department this year. A recent report from a paid consultant recommends several options for cutting the department's costs. The budget picture is looking better for the police department, though, and council members are planning to avoid planned cuts this year. Jones, who is in his late 50s, makes $126,500 per year as chief. City officials said Jones is eligible for a pension under city policies that allow firefighters and police officers to collect at age 55 with five or more years of service. It's expected that his pension will be calculated based on the average of his three highest-paid consecutive years multiplied by his total years of service and a 2.75 percent multiplier. A rough calculation shows that could be more than $20,000 a year. City Council Member Christopher Taylor, D-3rd Ward, said Jones' departure will be a loss for the city of Ann Arbor. "Chief Jones has led AAPD with calm and grace during a crucial era," Taylor said. "He was asked to do more with less and Chief Jones delivered. As he has often said, we live in a safe community, and to him we owe a debt of thanks." Jones also is well-respected in Michigan, said Bob Stevenson, executive director of the Michigan Association of the Chiefs of Police. “(Ann Arbor) is losing an excellent chief of police with a tremendous reputation around the state,” Stevenson said. Washtenaw County Sheriff Jerry Clayton expressed a similar sentiment. "The retirement of Chief Jones is a tremendous loss for the the City of Ann Arbor and all of Washtenaw County," Clayton said in an emailed statement. "He has been a strong leader and public safety partner and I greatly appreciate his friendship and the counsel he has provided me through the years." Jones came to Ann Arbor as chief of police in 2006 after serving as police chief in Sterling Heights. He began his law enforcement career as a Wayne County sheriff's deputy and also worked for the Inkster Police Department and Oakland County Sheriff's Department. Jones earned a bachelor's degree from the University of Michigan and a master's degree from Eastern Michigan University. Powers said the city will need to appoint an interim chief until officials can find a new police chief. He said he does not yet know who that will be. John Seto and Greg Bazick are the department's two deputy chiefs. Mon, Mar 5, 2012 : 4:53 a.m. He stayed long enough to get his chief's pension. Dedication to duty. Fri, Mar 2, 2012 : 8:27 a.m.
Ann Arbor,com why have you not reported about all the officers that took their lives maybe this ties into this??????????????????????????? Thu, Mar 1, 2012 : 5:45 p.m.
Chris Taylor has his eyes on the mayor's elected position. Thu, Mar 1, 2012 : 5:14 p.m. It's obvious that Chief Barnett didn't care enough about Ann Arbor to stick it out. Not unlike Roger Fraser who receives more than $40,000 and lifetime health care for the 10 years he was here. And it appears that Chief Barnett was quite opportunistic about when he would retire. Not unlike Roger Fraser. Bashing and blaming front line public service workers while rewarding and congratulating those at the top is hypocrisy. Thu, Mar 1, 2012 : 4:48 p.m.
Thu, Mar 1, 2012 : 4:23 p.m. The story has been updated with confirmation that Jones is eligible to receive a pension and the calculation will use a 2.75 percent multiplier because he is considered a police officer. The normal multiplier is 2.5 percent. With the higher multiplier, a rough calculation shows his pension could be more than $20,000 a year. Thu, Mar 1, 2012 : 11:49 p.m.
A $20,000 pension after working 5 years! When is AA gonna switch to a defined contribution plan rather than a defined benefit plan? Even the State of Michigan switched many years ago. Get with the program AA! Thu, Mar 1, 2012 : 5:06 p.m. The vast majority of city employees who have pensions and those who may retire in the future will have similarly sized pensions in comparison to Chief Barnett even tho they worked many more years often, 25 or more. And I don't think that Barnett came close to &quot;putting his life on the line&quot; during his short career. It seems that Chief Barnett pulled the retirement plug at the most opportune time considering the sad state of crime prevention in Ann Arbor. Thu, Mar 1, 2012 : 4:06 p.m.
Come to Saline, we are looking for a new police chief. Chief Jones is a great guy, hard working and cares about his community, but sometimes when your hands are tied you just need to move on. Saline City Council, please call him to schedule an interview ASAP! Thu, Mar 1, 2012 : 5:13 p.m.
Be careful what you wish for, Saline. Thu, Mar 1, 2012 : 2:22 p.m. Anyone else notice that A2 can't hold onto police or fire chiefs? The last two fire chiefs left saying they couldn't in good conscience make the cuts to their department wanted by the mayors administration, you can bet this is at the bottom of this resignation also. The mayors answer to public safety has always been &quot;let's roll the dice and see what happens,. then blame the unions and contracts when things don't work. Our neighborhoods are becoming unsafe but thats just a blip on the radar to the city administration. If things start going badly Heifje just won't run again, don't worry he'll be fine. Thats a pretty fountain though..
Thu, Mar 1, 2012 : 4:04 p.m.
HIeftje wants to go to Lansing and work for Snyder. &quot;Jones was pressured in recent city budget cycles to make deep cuts to the police department, cuts he didn't want to have to make. He expressed frustrations about that and repeatedly told council members he couldn't afford to lose any more police officers.&quot; &quot;We can't afford to lose a police officer,&quot; he told council members in February 2010. &quot;Since 2000, we've gone from 216-plus police officers down to 124. Our reality is we have been doing the best we can ... but we're at a point where there are some quality of life issues. As a police chief, I cannot stand here and say I can afford to lose any more police officers.&quot; First Lanza from AAFD and now Jones from AAPD. Both cited similar reasons for leaving. Ann Arbor won't appropriately fund public safety and city services, but will gladly throw millions at train stations, conference centers and public art that we don't want. When will someone have to courage to derail the crazy train? Thu, Mar 1, 2012 : 1:28 p.m.
&quot;Take the usual precautions&quot; = &quot;EVERY MAN FOR HIMSELF!&quot; And btw, Tru2Blu76, the Vikings -- even for their legendary ferocity -- had a well-developed and efficient code of justice. They were really good at ENFORCING their laws. Something that we don't manage to do at all in Ann Arbor. Breaking and entering is a lot like running Stop signs. What's to stop you if the odds are you can get away with it? Police run statistics, so do crooks. I'll bet anything there's a &quot;critical mass&quot; of police presence per population where at a certain ratio, you have an 80% chance, with the right conditions, of stealing everything in a home that's not in a safe: Passports, jewelry, etc. Little stuff that goes into pockets and then to the &quot;Cash-4-Gold&quot; people. Alarms will just tell you what you'll already find out when you get there: Your stuff is GONE. Thu, Mar 1, 2012 : 12:20 p.m. When you cut the police force almost in half, actual crime will increase while arrests &amp; prosecutions will decrease due to the shortage of &quot;boots-on-the-ground&quot; officers catching the crooks. A civilized, safe community must have the necessary resources deployed to control criminal activity and protect A2's law-abiding citzenry. When sufficient law enforcement is taken for granted, and not supported, the bad guys storm into the breach. Safe streets are the result of arresting and incarcerating felons. Due to political and economic circumstances in Michigan for the past ten years, effective law enforcement has been reduced so that, even in Ann Arbor, you no longer are safe from felonious criminal activity. If this trend is not reversed, it will only get worse. Now, you have no police chief, it takes time &amp; training to deploy more police officers on the streets, and the criminals are running rampant. Lock your doors &amp; contact your Mayor, city council, state representative, state senator &amp; the governor. Simply not true and not happening here. Unless AA.com is not reporting all these felonies, I have seen no reports of unsolved crimes in the streets of A2. As reported a week or so ago, the suspect who committed several sexual assaults was not identified, but double the size of the department would not mean that suspect would have been caught. I see no reason to believe A2 is less safer than it ever was. If you have some statistics that prove otherwise, post them. Thu, Mar 1, 2012 : 11:38 a.m. Attention all artists, Ann Arbor now hiring!! Thu, Mar 1, 2012 : 5:48 a.m.
Maybe it's semantics but...Chief Jones is RETIRING (with a City of Ann Arbor pension)...NOT resigning. Thank you Neal Berlin for 5 year vesting! Thu, Mar 1, 2012 : 11:52 a.m.
Neal Berlin - the twit that keeps on giving. Retiring is just resigning with a pension. Thu, Mar 1, 2012 : 4:59 a.m. I haven't seen the Bat Signal in the sky for some time, either. Has Bat Man left Gotham City? If this were a thousand years ago, in about 3 weeks, we'd be seeing viking long boats rowing up the Huron: straight at our defenseless citadel. This puts Chief Jones's Tuesday talk about public safety in a new light. I guess Chief Jones really meant it when he advised us to take on the responsibility for defending ourselves. Thu, Mar 1, 2012 : 4:41 a.m.
Thu, Mar 1, 2012 : 3:28 a.m.
No matter what anybody else says, you'll be missed Chief. Best of luck to you in whatever you do next. Thu, Mar 1, 2012 : 3:05 a.m.
Thu, Mar 1, 2012 : 3:01 a.m. I wish him all the best no matter what he ends up doing. I have nothing but respect for our law enforcement officers in this community and what they deal with on a daily basis. I was surprised to see Chief Jones's salary. It seems low. Thu, Mar 1, 2012 : 2:30 a.m.
For clarification - Police do not collect social security but must rely on their pensions. Police contribute to the pension system and, because of its solvency, the city did not need to contribute to the pension fund for at least a decade . Unlike other professions, including teachers, police officers' cannot transfer their retirement from one police department to the next. When changing departments they start over again at the new department. That is why it is especially devastating to be layed off in mid-career. Lastly, did Barnett Jones &quot;resign&quot; or announce his retirement? Thu, Mar 1, 2012 : 6:21 p.m.
Mixmaster, what are you talking about? They don't have a &quot;SS contribution.&quot; Medicare taxes are deducted from their checks, but SS is not. Their pension contributions are deducted from their paychecks in place of Social Security contributions, and in many cases, the amount is much higher than it would have been it it was SS. In Ypsi, for example, at least 10% of wages, AFTER wages are taxed, go into the pension fund. Thu, Mar 1, 2012 : 4:02 p.m. But Police and Fire have the opportunity to invest their SS contribution however they wish unlike other employees. Shame on those who didn't and kudos to those who did. Thu, Mar 1, 2012 : 2:25 a.m. The biggest failure of the Ann Arbor City Council and Mayor John Hiefje's administration over the last decade has been the complete collapse of the Ann Arbor police as a viable deterrent to crime. Crime has skyrocketed under this administration as they fiddle with greenways and public art. Thu, Mar 1, 2012 : 3:59 p.m.
Perhaps you could give us some examples of crime running amok? I do not see it. Thu, Mar 1, 2012 : 1:37 p.m.
Don't ask the mayor. &quot;Fires are down, crime is down&quot;...in Candyland. Thu, Mar 1, 2012 : 9:08 a.m.
Thu, Mar 1, 2012 : 1:46 a.m.
&quot;Ann Arbor Fire Chief Chuck Hubbard said he talked to Jones two days ago about routine business and Jones gave him no indication he was planning to retire. Hubbard learned about the retirement over a brief email that he received Wednesday.&quot; Very fishy. Something is wrong with this picture if your day to day colleagues don't know about a retirement after 40 years of service two days before it's announced in an email. What's going on? And then, &quot;no comment.&quot; Something is wrong with this picture and we are not getting the full story. Of course, with crime increasing and police being cut, it's a losing situation all around. Good luck to Jones. Thu, Mar 1, 2012 : 2:50 a.m. I think Ann Arbor will be safer now. Thu, Mar 1, 2012 : 12:14 a.m. YES 40 years is a long time. Wonder how many pensions/retirement benefits he will be receiving? Didn't he retire from his last job before taking on A2? I'd like to know what his benefits and retirement payments will be. This is where public employees are doing very well these days. Thu, Mar 1, 2012 : 12:02 a.m. When Roger Fraser is appointed EFM for the City of Detroit in April, look for Jones to be his police chief. Thu, Mar 1, 2012 : 4:21 a.m.
Signatures submitted today for referendum, likely putting all EFM's on hold until Nov election! Democracy will determine next steps. Thu, Mar 1, 2012 : 1:14 a.m. Wed, Feb 29, 2012 : 11:59 p.m. Wed, Feb 29, 2012 : 11:30 p.m.
With such severe cuts into the police staff, no wonder crime is running rapid in the city. And, most probably we will follow the directions of Craig with regards to hiring a new chief. It is sad indeed. Wed, Feb 29, 2012 : 11:10 p.m.
this is sad news. but... at the same time... a huge thanks for your service and best wishes. Wed, Feb 29, 2012 : 10:37 p.m. Thank you Chief Jones for your time serving Ann Arbor. I grew up here, and have always felt very safe in my hometown. I hope that all of these incidents and crimes serve as a wake up to Ann Arbor's citizens that it's time to truly examine the actions of our local government. Surely public safety should be a priority over public art and many other things. Wed, Feb 29, 2012 : 10:08 p.m. Wed, Feb 29, 2012 : 9:55 p.m. So how does the UM police chief merit $200,000/yr and a $30,000 signing bonus if the AA police chief ony makes $124,000? Is it really harder to be a campus police chief than a major municipal police chief? No wonder President Obama and Governor Snyder said that those universities that control their budget will get more state and federal support. Thu, Mar 1, 2012 : 3:58 p.m.
Is it harder to be a campus police chief than a major municipal chief? Yes it is. Not only do you have streets to patrol like city, you also have responsibility for the 24 hr safety and security of all the buildings. A university owns the structures and all the stuff inside them, unlike a city, including the residential areas. When an alarm goes off, your officers are responsible to respond and investigate the entire building, not the owner of the building. In a city when an alarm goes off and an owner chooses not to respond if there is no sign of forced entry, the police leave. At a university, when an alarm goes off the officers have to enter and search the entire building. You can't just leave if the building looks secure from the outside. You have to know not only your external geography, but also all those buildings internally, how they are laid out, the fire systems, etc. If you took the total square area of the buildings and spread it in single story buildings, you would have quite an expanded area. And the politics can be frustrating. So yes I think it is much more complicated than being a municipal chief due to added responsibilities. However I do believe he pay is way out of control, way too high and it does not seem to attract good candidates. Also I do not consider A2 a major municipal city. Detroit, Chicago, New York, LA are major municipalites. Ann Arbor is a medium size city at best. Thu, Mar 1, 2012 : 3:08 p.m.
Department seniority might have something to do with it, but that's only speculation on my part. Wed, Feb 29, 2012 : 9:54 p.m.
Of course he has 5 years in....and will get a pension for life. WHY doesn't AnnArbor.com report that??? They know how long he has been employed. Wed, Feb 29, 2012 : 9:16 p.m. I'm curious how much banked OT, Comp, Vacation and Sick time Chief Barnett accrued during his 5 year &quot;career&quot;. All that gets rolled into his final payout and is a factor in determining his monthly retirement check. The amount of money Chief Barnett gets pales in comparison to Wes Prater, former AAFD, now a politician in Ypsilanti Township. Late 50's and retiring? It must be nice but things must be getting tough for him? Wed, Feb 29, 2012 : 9:03 p.m. Wed, Feb 29, 2012 : 8:49 p.m. So this is a case of a bureaucrat, no matter how loved, putting in his minimum years so he can get another pension to add to his final retirement at 65. Give me a break! Wed, Feb 29, 2012 : 9:11 p.m.
No, he can begin collecting as long as he's over 50. Police and Fire a minimum age of 50 and 5 years minimum in service. The health care lats as long as he does and becomes the secondary insurer at age 65. The recent change to 10 year vesting won't apply to Chief Barnett. Wed, Feb 29, 2012 : 8:40 p.m. He just made the minimum time in for retirement and health care. Wed, Feb 29, 2012 : 8:20 p.m.
A true professional. He will be missed. Wed, Feb 29, 2012 : 8:19 p.m.
where do you find the next victim?it seems like Ann Arbor has become the place NO public safety official wants to work.Imagine That. Wed, Feb 29, 2012 : 8:17 p.m. I wish him the best... he tried, but working in OZ and trying to deal with prince john and his merry band envokes powers way beyond human capability...the old adage holds true when it comes to trying to bring a reality check to our fair city and the insane politics and policies therein...&quot; you can't polish a t _ _ _.
I have the utmost respect for Chief Barnett Jones. He had a tough job and did it well. He served the public not any particular constituency. I wish him the best in retirement and I would like to thank him for 40 years of dedicated public service. Wed, Feb 29, 2012 : 7:54 p.m.
Wow. He stood right there at a neighborhood meeting last night telling everyone how much he cared about our safety and security. Not even a hint that this was retiring. Sigh. Well, I wish him well and thank him for all his years of dedicated service. Wed, Feb 29, 2012 : 10 p.m.
40 years in public service... not necessarily A2, but he deserves a thank you anyway. Wed, Feb 29, 2012 : 8:51 p.m.
All 5 years? For a pension? Which is probably also getting from any other job he has ever had in law enforcement. Wed, Feb 29, 2012 : 8:08 p.m.
All of his years? At which job? Wed, Feb 29, 2012 : 7:53 p.m. The Chief is a true professional not only concerned with the people of Ann Arbor but his Force also. Let's hope the search for a replacement starts and ends within Police Headquarters. Wed, Feb 29, 2012 : 8:07 p.m. He so concerned, he's leaving?????????? Wed, Feb 29, 2012 : 7:42 p.m.
Jones was a figure head at best. He did whatever Council and the Mayor to him to do. Never showed his face around the troops and never fought for jobs but only postured. He'll resurface in some other job somewhere and taunts all of his grand accomplishments. Got to look deeper at what is boosted by him. Graduated UM, yes but Dearborn, he's a master of deception. Wishing the best to the fine officers of AAPD. Thu, Mar 1, 2012 : 3:43 p.m.
We have to assume you have some inside information on &quot;Never showed his face around the troops.&quot; It has been frequently reported he feared further cuts in positions but the fact is cities are run by elected officials and a department head does not have the ability to demand funding. I do not see council members being voted out very often, an indicator that the majority of residents are comfortable with what the city is doing. But to imply that he should have not done what his employers ask him to do makes no sense. Perhaps he disagreed and that is why he is leaving. As to resurfacing in another job where he will accomplish something grandiose, would that not require he end up in a city with a thriving economy? Perhaps you know of some cities? Ann Arbor is much more healthy than many US cities. Ah alas, the truth! Thank you. Wed, Feb 29, 2012 : 7:41 p.m. The obvious solution to these problems is raise taxes, raise parking fees, and allocate more funds for art. Wed, Feb 29, 2012 : 7:37 p.m. Wed, Feb 29, 2012 : 7:35 p.m. Wed, Feb 29, 2012 : 7:30 p.m.
there must be a book somewhere in this!!!! the ship is taking on water!!!! Wed, Feb 29, 2012 : 7:27 p.m.
Well.....Look on the BrightSide!! we have a super ugly 3/4 of a million dollar fountain to look at as we are robbed, stabbed, and raped. Just sayin....that could really help. Wed, Feb 29, 2012 : 7:22 p.m. Sounds like the citizens of AA are in trouble. When a 40 year veteran police officer and a veteran fire chief decide that they can't make any more cuts and leave their jobs, things are not good in AA. Sounds like the council needs to start thinking out of the box on these problems. Thu, Mar 1, 2012 : 3:36 p.m. Wed, Feb 29, 2012 : 8:06 p.m.
We are definitely in trouble; we have a leadership that has the opportunity to retire/bail and kick the can down the road for the next set of &quot;leaders&quot; to deal with the problems; just like our congress has done to us in Washington. Wed, Feb 29, 2012 : 7:11 p.m.
Well that was short lived. He was only the chief for over 5 years. Must not be able to handle all this recent crime in Ann Arbor, so why not make it someone else's problem. Thu, Mar 1, 2012 : 3:35 p.m. Wed, Feb 29, 2012 : 8:28 p.m.
You are funny. Somebody who served the public for 40 years and spent 5 years as chief. Maybe he felt under appreciated being both fire and police chief and receiving (comparatively speaking) low salary considering he is doing 2 jobs? Wed, Feb 29, 2012 : 7:02 p.m.
&quot;Since 2000, we've gone from 216-plus police officers down to 124.&quot; That is 57% of the 2000 level. Since 2002, Part 1 Crimes have gone down from 3,770 to 2,758. That is 73% of the 2002 level. If we had 73% of the police officers we had in the early 2000s before the cutting started, we'd have 157. Even taking into account the merger of the 911 call center with the county and the 19 of police department employees who dropped out of the statistics because of that, we would have to have 138 to have the same number of police per serious crime. So we are about 14 short. Of course with the crime spree at the start of 2012, the 2011 level of crime may be a low that we may not see in 2012 and more staff may be required. My own observation is that the perception of safety downtown has declined and we need foot patrols and bicycle beat cops downtown again daily, as well as more than five officers in patrol cars per shift to serve the rest of the city and be able to respond to calls timely. We all thank the Chief for his service to the community (and his candor in fighting for higher staffing levels) and I wish him a happy and healthy retirement! Thu, Mar 1, 2012 : 3:34 p.m.
&quot;Of course with the crime spree at the start of 2012...&quot; Crime spree? What crime spree? Maybe I missed that. Another thing to consider. With increased police officers crime rates go up. A good police officer will self initiate many cases during traffic stops and investigating suspicious people. High statistics do not necessarily mean crime has run amok, it may mean police are uncovering more crimes. I read this news service regularly and unless AA.com is engaged in a cover up, I do not see any indication of declined safety downtown, either in the press or while in the city myself. Thu, Mar 1, 2012 : 12:16 p.m.
&quot;We all thank the Chief for his service to the community (and his candor in fighting for higher staffing levels) and I wish him a happy and healthy retirement!&quot; Speak for yourself. Wed, Feb 29, 2012 : 8:04 p.m. Wed, Feb 29, 2012 : 7 p.m. Lets not forget Cheif Jones is caught in the middle of a heated law suit ........the owners of Dream Night Club are suing Mr. Jones in Federal Court...........Stephen Postema no longer wants to run for Malinda Morris seat as Judge ????? Hmm something smells fishy!!!! Thu, Mar 1, 2012 : 12:43 a.m. The Dream-Nite lawsuit seeks $3 million in damages. It alleges, among other things, anti-Indian bias. Steve Postema claims that a foot injury has necessitated his withdrawal fro the judge's race. Wed, Feb 29, 2012 : 6:58 p.m.
Chief Jones has upheld the dignity of his position in trying circumstances. My prayers and best wishes will follow him. Wed, Feb 29, 2012 : 9:09 p.m. He does his own praying. Every morning in City Hall, on taxpayer time. Wed, Feb 29, 2012 : 6:56 p.m. I don't blame Ann Arbor Police Chief Jones Barnett Jones one bit. Time to go buy a shotgun (for home defense). Wed, Feb 29, 2012 : 6:51 p.m. When you take the job of Police Chief, you are serviing in a high profile public position. You will be judged, by your subordinates, citizens, and elected officials. How you perform, your ethics, your character, and the way you are all very much a public matter. If you don't like the attention, don't take the job. Wed, Feb 29, 2012 : 6:52 p.m. Wed, Feb 29, 2012 : 6:49 p.m. Retiring or bailing out, who would want the job in Ann Arbor as the department is reduced to a number that makes it nearly impossible to be effective and provide the level of public safety most citizens (city council excluded) would expect to be normal and reasonable. Best of wishes on your retirement, after 40 years of public service, you deserve an opportunity to take a break and enjoy life without the level of stress associated with this job. Thu, Mar 1, 2012 : 3:23 p.m. Wed, Feb 29, 2012 : 6:48 p.m.
Getting a little hot in the kitchen? Can you smell the cooking! Thu, Mar 1, 2012 : 9:12 a.m.
Is that Bacon I smell? Wed, Feb 29, 2012 : 6:28 p.m. He is certainly entitled to retire. But his timing makes it look like he is bailing. Wed, Feb 29, 2012 : 8:50 p.m.
An $18,000 pension is not bad for years! Wed, Feb 29, 2012 : 8:05 p.m.
All he needed was 5 years to be vested in the city's pension...perhaps he'll move on to a another law enforcement job . Wed, Feb 29, 2012 : 8:02 p.m.
johnnya2 Let me clarify one thing. I agree he can retire whenever he chooses. As to &quot;There is never a time that would satisfy people&quot; I disagree. A couple years ago would have satisfied me! Wed, Feb 29, 2012 : 7:59 p.m. I agree johnnya2 relax! But I think I can wonder why now in the midst of all the press conferences. Wed, Feb 29, 2012 : 6:57 p.m. Allow me to clarify what I meant. The headline that reads he's resigning, instead of retiring, makes it seem like he is bailing. He is free to retire at a time of his choosing, and once I read that it was to retire after 40 years in law enforcement, I no longer thought he was bailing. My criticism was of Ann Arbor.com, not Chief Jones. Wed, Feb 29, 2012 : 6:40 p.m. Wed, Feb 29, 2012 : 6:36 p.m. I thought that when I read the headline. Wed, Feb 29, 2012 : 6:16 p.m. Came in 2006, was appointed as the fire chief (last year? 2 years ago?) The real questions: What is his severance? retirement benefits from the city? The real question is what the heck are you talking about? He's the chief of police - he oversees the position of fire chief as the public safety administrator. Wed, Feb 29, 2012 : 6:15 p.m.
with all the stuff that is going on in a2 i also would retire. breakins, rapes and less police. but we got 1.6 mill for art. next idle law, and crosswalks that should help out the city. Wed, Feb 29, 2012 : 8:24 p.m.
nowhere near enough cops to do the job City Council.lost another good man but got a whole lot of great art. Wed, Feb 29, 2012 : 6:30 p.m.
Sarcasm: The warrant of choice for those with no warrants. Wed, Feb 29, 2012 : 6:12 p.m.
we must hire an out of state recruiting group immediately @ $225,000 to do an Intergalactic search for a new chief. Wed, Feb 29, 2012 : 8:23 p.m.
search on.bet they find nobody good.but boy they got the bucks to buy art. Wed, Feb 29, 2012 : 6:09 p.m.
Why is this not the top story? Wed, Feb 29, 2012 : 11:04 p.m. I agree with a2.com on this one. Mark's Carts new cigar bar should be the lead story. Wed, Feb 29, 2012 : 6:06 p.m.
Good luck! 40 years is a long time to serve the public!